Remember when I gave you the recipe for the Asian Lettuce Wraps and told you that you were going to have to invest a few bucks on the ingredients but it would be worth it because you’d fall in love with them and find a bazillion dishes you’d want to add them to? Well, here’s one. You’re welcome. I got home to find the current issue of Taste of Home magazine in the mail with a note stuck inside saying that my Soba Salad recipe had won First Place in their Meatless Mania recipe contest. Holla! LOVE this! So yummy and refreshing. Will make again, can't wait to take it to a BBQ it makes a great salad for gatherings. My husband & I made this for dinner tonight - quick, tasty & a good source of protein with the edamame. We did sauteed the cabbage, carrots, edamame, etc. It tasted so great we didn't miss the basil (completely forgot to put it in). This was great. I couldn't find shelled edamame without more shopping so I used green peas. Really good. For dressing, combine all ingredients and mix well. Cook noodles according to package directions. Rinse with cold water and drain well. 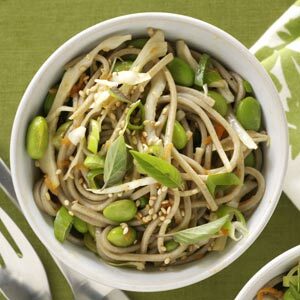 Assemble salad by tossing cooked noodles, coleslaw mix, carrots, edamame and green onions in a large bowl. Drizzle with dressing and garnish with toasted sesame seeds. *Soba noodles are Asian buckwheat noodles. I use whole wheat linguine when I can’t find soba at the grocery store and like it just fine! T of H garnished theirs with what they write are basil leaves for this photo (though I think it looks like mint) but I'm not sure I think either are a great idea. But then again, T of H magazine is a freaking huge profitable corporation and I'm a broke working mother so... they might know more than me about cooking. Just a little. Maybe.